We’d love your help. Let us know what’s wrong with this preview of Flying Blind by Caroline A. Gill. To ask other readers questions about Flying Blind, please sign up. If you want a book that shatters all illusions about flies, this is it. Iolani pulls people to the safety of her farm home through the flies' vortex, away from the soul snatchers. In this book the soul snatchers use tornadoes, hurricanes and destruction to lure people into their vans, promising them help, only to steal their souls and their lives with the glowing green lanterns. After being betrayed, the farmhouse is attacked, and Iolani ends up locked away with not even the flies to help her. A If you want a book that shatters all illusions about flies, this is it. After a series of events, including the death of a loved one and the awful betrayal of another, Iolani bumps into Cheesie (who I simply adore!) and recovers. She sets out on her own to try, once again, to stop the soul snatchers. I want to shout from the rooftops what happens next but I really don't want to ruin the book..
Again, this book shows the magic between a young girl and house flies, I said this after the first book but, I seriously can not believe how much I loved a book about flies! The creative, descriptive, incredible writing really makes me believe in everything this book tells. Once again I became so enthralled with this book, I didn't put it down. The second book in a fascinating dystopian fantasy series. The first book is always my favorite as it introduces the new world and characters. This second book continues the magical journey. It also introduces some new characters. It is paced well and picks up where the first book leaves off. It does the characters justice and doesn't disappoint. If you read the first one, and I'm assuming you did, read this book to continue the adventure. Iolani is back and trying to save everyone she can from the stealers with the help of her trusty friends the flies yes I said flies. The flies do whatever Lani asks them to do. Her fly friends help her get out of some very tough spots that she somehow manages to get herself into most of the time with the help of others that either want to stop her or use her and her flies for their own purposes good or bad. Lani is kidnapped and is made to do things with the help of her flies that she would neve Iolani is back and trying to save everyone she can from the stealers with the help of her trusty friends the flies yes I said flies. The flies do whatever Lani asks them to do. Her fly friends help her get out of some very tough spots that she somehow manages to get herself into most of the time with the help of others that either want to stop her or use her and her flies for their own purposes good or bad. Lani is kidnapped and is made to do things with the help of her flies that she would never ever do in order to keep her family and her new friends the now orphans that she has saved from the stealers alive and safe. She is blackmailed into using her fly magic to steal some very valuable things for someone else. After she is kidnapped and kept locked up for a while Lani has sort of a nervous breakdown and almost loses it all but she is brought back to reality with the threat of her family and friends lives hanging over her head. She knows if she doesn’t take the things that she is told to steal then her family will be taken from her. Really what choice does she have? But Lani wakes up and is not quite as naïve as her captors think she is. While Lani is out doing the bidding of her captors she does a little exploring of her own and while she is out on her little trip she meets a new friend Cheesie who helps her when she is at her lowest and cannot help herself. Cheesie is a breath of fresh air and I don’t think anyone can help but love him. He is one doozy of a character that will capture your heart the first time you lay eyes on him. But Lani is a tough chic whom no one can keep down for long not especially when she has people that is counting on her and she thinks she is the only one that can save them and maybe she is but they are there for her when she is down and really, really needs their help. This is a uniquely odd book,and I really enjoyed it.The author has a beautiful and elegant writing style.The addition of a strong and brave young woman fighting to save the world from the memory stealers is inspiring.I was unsure about this series when I first heard about,but I'm really glad I gave it a chance.I received a copy of this book from the author in exchange for an honest review. Reading the first book you quickly get wrapped up in to the story and you just need more. The author definitely delivered and continued where the first book ended. The battle was won but the war is on going and with a new rag tag sort of team you get it is time to go along a new adventure fighting the same beast. I was blown away by the writing and thought the story flowed naturally. The new characters were a great addition and the old characters were welcomed back with open arms from me. The sp Reading the first book you quickly get wrapped up in to the story and you just need more. The author definitely delivered and continued where the first book ended. The battle was won but the war is on going and with a new rag tag sort of team you get it is time to go along a new adventure fighting the same beast. I was blown away by the writing and thought the story flowed naturally. The new characters were a great addition and the old characters were welcomed back with open arms from me. The special elements of the fly magic makes this series unique and a refreshing read. My favorite character was Cheesie. He made me giggle and make a prominent character instead of being on the sideline. I felt for him deeply and wanted him to succeed each step of the way. He was perfectly complimented by Al especially in the early scenes. My favorite scene came near the beginning which featured Al and Cheesie at the strawberry stand. It was different and you got a good look at how each of those characters were going to evolve. It wasn't a huge moment but it meant something to me. Lani's back and has more enemies but still has her flies! Iolani Bearse has already taken Chong and the memory Stealers and won. But that doesn't mean the war is over! This is an action packed sequel to The The Flykeeper and in my opinion, a must read. Follow Lani on her flysight travels into trouble, and out. Read about loss, love, and true friendship. I described “Flying Away” as wonderfully strange and meant it in the best possible way. Flying Blind picks up where Flying Away left off where Gill uses her wonderful style of writing. Her trademark prose is reminiscent of Lewis Carroll’s Mad Hatter-style of high fantasy and the imagery it evokes is great. This story is told in multiple points of view, but Iolani (Lani), our heroine from Flying Away is the anchor. Her powers have grown and so have her enemies. Some friends and allies may, in fact, not be as they appear. The introduction of some of the secondary characters gave a chance for the author’s wit and humor to shine among the tension. They were both lovable and irritating, but provided some great comedic relief. It was also a nice touch to see senior citizens portrayed as heroes and rich characters, rather than expendables to the youthful characters. There’s some heartbreak, heartache, and some notable absences in Flying Blind. Some threads are left hanging from the first and second book, which will need resolution in the grand finale. Caroline A. Gill has an enormous amount of talent. I love her writing style and vivid imagination. Where some attention needs to be devoted, however, is to the overarching plot. There is a roving aspect to the writing, which I don’t mind, but the plot seems almost ad hoc in some places. This book would have benefitted from sticking to its core premise and driving it home. All in all, I recommend Ms. Gill’s work and hope people pick it up. It is strange and unique, compelling and otherworldly. “Flying Blind” by Caroline A. Gill was an interesting installment in the Flykeeper Chronicles. This time we get an in-depth look into the imagined world of flies—how they see, how they behave, how they eat. Iolani’s story intertwined with a new character, an elderly man named Al. His story interested me. Al was a simple man in retirement living out his days in a senior living facility. Then the Stealers came along and changed his life. He learned about strength and friendship through his ordeal. “Flying Blind” by Caroline A. Gill was an interesting installment in the Flykeeper Chronicles. This time we get an in-depth look into the imagined world of flies—how they see, how they behave, how they eat. Iolani’s story intertwined with a new character, an elderly man named Al. His story interested me. Al was a simple man in retirement living out his days in a senior living facility. Then the Stealers came along and changed his life. He learned about strength and friendship through his ordeal. He also discovered the secret that the Rising Sun Corporation didn’t want people to know. I admired his resiliency. He learned to appreciate the people who entered his life, Cheesie (a former roommate) and Ginny (a woman who saved him from the desert heat). You have to love this man who acted with his brain and not his heart. I felt bad for Sam who turned out to be just another pawn in the conspiracy. He was so well-programmed that he’d forgotten the role he used to play in Iolani’s life. I only hope in the conclusion that Sam regains his memories. Iolani… what can I say? This girl is wrecked. Her emotions are as varied as the colors of butterfly wings. She has a deep-seated need for revenge tangled up with her concern for others. She makes decisions that should be beyond the scope of a sixteen-year-old. I still haven’t decided whether I like her character. Authors do a lot of things in the name of research. I have to wonder just what type of things Gill did to come up with such vivid details about the life cycle of flies. An interesting twist in the story, however, were the grasshoppers. Will we get more of these insects in the next installment? 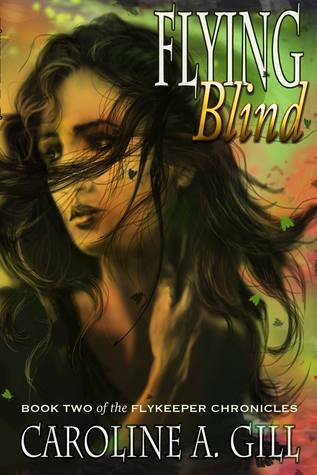 “Flying Blind” is an intriguing tale. What will the conclusion bring? Caroline Gill has managed to make the happy ending from book one quickly disappear into oblivion. Malcolm is nowhere to be found, has he been forgotten or is he being given a gift by Lani not bringing him into another catastrophe?! This book is just as much, or more, heartwrenching to read as the first one as Lani is broken mentally and physically over and over again until you're sure she's seen the end. Except she can't seem to ever find peace or death. Her flies are her only loyal and constant Caroline Gill has managed to make the happy ending from book one quickly disappear into oblivion. Malcolm is nowhere to be found, has he been forgotten or is he being given a gift by Lani not bringing him into another catastrophe?! This book is just as much, or more, heartwrenching to read as the first one as Lani is broken mentally and physically over and over again until you're sure she's seen the end. Except she can't seem to ever find peace or death. Her flies are her only loyal and constant friends and comrades. They're the only ones never to give up on her and always do whatever it is she needs from them. We are introduced to two new characters who are endearing, eccentric, and thrust into a crazy world they're woefully unprepared for, but handle in stride. They add in what would be comic relief if this weren't such a dark tale. The real magic is that this story is so bizarrely different, amazing, and fresh all wrapped up in simple creatures, simple dreams of freedom and happiness, and simple people who must step out of their comfort zones in order to have a chance at saving humanity. Even with Chong behind bars, it hasn't stopped the memory merchants... The 'Memory Stealers' are still at work, and Iolani is gearing up for war! Once again Caroline's book emphasizes Love and Family and Fly Magic... Friendships and Traitors... And this time even Revenge! ... "I knew dirt. I loved dirt. I wallowed in it. He had no dirt on him. ... At least, that's what the cameras in the corners of the room recorded. From his hair and his pockets, fly eggs fell on me, like sprinkles on a cupcake. Even with Chong behind bars, it hasn't stopped the memory merchants... The 'Memory Stealers' are still at work, and Iolani is gearing up for war! ... "I knew dirt. I loved dirt. I wallowed in it. He had no dirt on him. ... At least, that's what the cameras in the corners of the room recorded. From his hair and his pockets, fly eggs fell on me, like sprinkles on a cupcake. Some landed in my hands, some on my tongue; I didn't care. Freedom fell around me. Power and possibility made me giddy for the first time in forever." Yep, fly magic, what can I say! Other than saying that it totally works. And as for Caroline Gill's writing, her imagery, well I get it, in the heart... Wow! Book two in the Flykeeper Chronicles, and after reading book one I wasn't sure I wanted to continue with the series but I kept going back and forth and finally decided to continue and I'm glad I did. Where I felt book one was all over the place, I felt book 2 had a more stable storyline and it's probably because of book one I felt this way. It makes you look a flies in a different light, such a common bug that you don't really think about unless they are flying around you. Caroline created anoth Book two in the Flykeeper Chronicles, and after reading book one I wasn't sure I wanted to continue with the series but I kept going back and forth and finally decided to continue and I'm glad I did. Where I felt book one was all over the place, I felt book 2 had a more stable storyline and it's probably because of book one I felt this way. It makes you look a flies in a different light, such a common bug that you don't really think about unless they are flying around you. Caroline created another world and I truly felt it was well written and developed. I still had problems connecting to Iolani but she is a strong female and gets the job done. The Soul Stealers are super creepy and make great scary nighttime stories! Overall I enjoyed reading and am looking forward to the next. The Memory Catchers are back and using natural events to cover their stealing. Lolani is still controling flies and using them to wreck havoc. We are rewarded with a great read with lots of action and spine tingling danger. A great read with the characters we met in book one continuing to provide us with a great story that stretches our emotions to the brink. The magic is back. Once again, this proved to be a unique and intense adventure. I loved the side stories, the details and the constant battle of really bad versus a young girl with only the magic of her flies on her side. Can't wait to read the next one. I absolutely love this book. Caroline has a way of making you fall in love with her books. I actually got sucked in and didn't want to put it down.